SCOTTSBURG, Ind. (WLS) -- For the second time this week, a turkey caused major damage to the windshield of a car on an Indiana roadway. The Indiana State Police reported the Wednesday night incident on their Facebook page. The crash took place in Scottsburg, on the southern part of the state just north of Louisville. 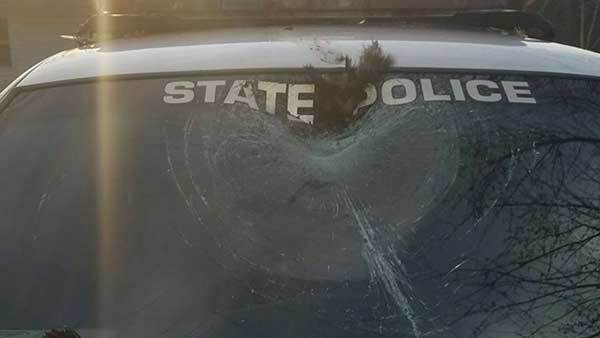 Trooper Tia Deaton was on State Road 56 when a turkey flew into her windshield. Deaton was unhurt. The turkey did not survive. A 30-pound wild turkey was killed Tuesday morning when it was impaled in the car windshield of a New Jersey family visiting Notre Dame University in Indiana, according to the La Porte County Sheriff's Office. The Taraboczhia family of Emerson, N.J., had just left Notre Dame, where their daughter Riana was just accepted, and was traveling west on U.S. 20 near Wilhelm Road when the bird flew into the path of their rental vehicle. "And out of nowhere this turkey starts flying. I see the wings open up, coming right at me," said John Tarabocchia. The male turkey was killed on impact. The La Porte County sheriff said incidents like this are rare, but wild turkeys are mating right now and the birds are in abundance less than a month before hunting season starts again. "I just knew I was on the highway and, uh, a lot of tractor trailers on the road, just wanted to get them off to the side," John said. The Tarabocchias were able to get another rental car, drove to O'Hare International Airport and made their flight. John said he believes divine intervention helped him steer the SUV safely to the side of the road. "I thought he'd go over the roof of the car instead he went right over the windshield," he said. John said it happened in microseconds. "At that point I was just trying to get the car pulled over," he said. The occupants -- John, his wife Corina, teenage son Ian and his 78-year-old mother-in-law -- sustained minor cuts from the glass. Feathers were everywhere. The rearview mirror was pummeled, and suddenly they were face to face with a 30 pound turkey. "Everyone wanted to get out of the car because they were afraid of the turkey, it was still alive in the window," John said.